With change being the one thing we can count on, it makes great sense to prepare for it. But what kind of change? And when will it arrive? And how disruptive will it be? We can conjecture as best we're able (and that's what we do on a daily basis here at PeakProsperity.com), but the actual details of the future will remain unknowable until they unfold. Which is why we recommend that everybody cultivate a foundational level of emergency preparedness. Doing so will give you valuable resilience in addressing the surprises the future may have in store -- whether they are related to the Three E's or not. When the unexpected strikes -- be it an economic crisis or, a hurricane, or a car breakdown -- a little advance preparation will have a very outsized impact on how well you end up faring. So please review the following list of preparedness necessities. Our strong recommendation is that you begin your resilience-building journey by procuring the items listed below if you don't already have them. But preparing isn't just about amassing gear, there are also a number of essential actions to take. We'll get to the specific recommendations in just a moment. But we've received requests from a number of readers to simplify the process here and offer a few "all-in-one" packages. These are for folks who want to get the basics covered in the shortest period of time (i.e., immediately) and don't have much interest in procuring each item individually. If you decide to purchase one of the above packages, we still recommend that you read the rest of this guide to understand the function and importance of the gear, tools & supplies you'll receive. The highest priority resource to get under your local control is water. During an emergency, especially in the aftermath of a natural disaster, access to the water supply you depend on can become contaminated or cut-off. Humans can live for roughly three weeks without food, but will perish after three days without water. Just as importantly, many diseases are water-borne, so sufficient access to water must ensure quality as well as quantity. The official recommended water storage rule-of-thumb is one gallon per person per day. It's important to note this is the minimum recommended amount. Several factors -- such as the presence of injured or sick parties, nursing mothers, or hot weather -- can easily double the water needed. In our opinion, everyone should at least have 3 day's worth of water stored per household member. No matter where you live, even in a cramped high-rise studio, this should be absolutely doable. For your 3-day supply, it's easiest to purchase 1-gallon plastic water bottles at your local grocery store. For just $10 per person, the insurance this purchase provides make it one of the absolute best investments you can make with your money. And oftentimes, these bottles come six-in-a-box, which makes stacking them away in a closet, basement, or garage a snap. Just note that the plastic starts to leech after too many months, so you'll want to replace the bottles every year. For those with the options to store more, we recommend striving to have 2 weeks worth or more (both of us have a month's worth). We're big fans of the WaterBrick, a storage solution specifically engineered to be as durable, stackable and portable as possible. Your supply of stored water may last only so long. After that point, having the ability to render potable any water you can find from a nearby source is critical. There are many different types of water filter and purifies out there, and we recommend owning several so that you have redundancy in case one or more of your solutions get lost, broken or otherwise fails you. But our chief recommendation is to own a media filtered water system. These use gravity to send water through the micro-pores of purifying 'candles' -- a process that is extremely efficient at removing particulates and bacteria. There are no moving parts to break, and these filters have a long history of dependability and longevity. Specifically, we recommend the family of Berkey water filters. You can run practically any type of water through the unit and get fresh, pure drinking water as a result. With your Berkey procured, it's a wise idea to also own a portable water purifying system, too, for when you're not at home. Katadyne manufactures an excellent line of them, popular with hikers and relief workers. Adding additional emergency backup with low-tech solutions like LifeStraw and water purification tablets makes a lot of sense, too. Much more can be learned about treating, storing, irrigating, and conserving water in our Definitive Water Thread. Once upon a time, there was a person in every community whose job it was to ensure that sufficient food stocks existed in their town to carry the people through the winter. Their job was to travel to all the farms and granaries, total up all the food, divide by the number of people in town, and assess whether the community would be able to make it through to spring. In fact, it's only very recently that we have lost this function, and today most people think it rather odd to even wonder about food security. When we examine the "just-in-time" delivery system that keeps us fed in this country, it's hard not to grow concerned. Most communities have, at most, a total of three to five days’ worth of food on hand in their local grocery stores and supermarkets at any given time. In other words, if delivery trucks stopped rolling into town and everyone then went down to the store to buy what they needed, the stores would be stripped bare in no time at all. If you've spent time in hurricane country you know what we're talking about —but for people who haven't seen this dynamic at play, it may sound quite foreign. Given this knowledge, putting a reserve supply of food into storage makes sense. And it's simple to get started: simply start buying more of what you already know you like to eat. Just peek into your cupboard before your next trip to the grocery store and get more of whatever is in there. After a few trips, you'll be well on your way to having a "deep pantry" to rely on if suddenly outside access to food becomes compromised. As an added bonus, when the price of food is rising, buying food in advance of when you plan to use it is a real money-saver. Obviously you should consider the storage limits for the foods you seek to store, as there's no sense in buying three years' worth of something that has a shelf life of 12 months. In addition, this strategy requires a rotation process, but it's pretty simple: place newly-purchased items at the back of the shelf while pulling forward the older cans/jars/packages that are already there. A well-stocked deep pantry will see you through most short-duration (days, or up to 1-2 weeks) emergencies. Of course, this will depend heavily on the depth of your pantry, the number of people you're feeding, and the length of time without outside access to food. We recommend everyone shoot for at least 2 weeks of deep pantry supplies for the mouths in your home. But if a bigger crisis were to occur that required you to be self-sufficient for a much longer time -- a liquid fuels shortage, perhaps, or a major breakdown of the electrical grid, or massive social unrest -- you'll need more than pantry stores to feed yourself and your family. Yes, the odds of needing such stores is low (thankfully). But it's not dismissible. Even though though the chance of your home burning down this year is tiny, you still invest in smoke detectors, right? And the added security and peace of mind you enjoy by securing several months or more of food stores greatly outweighs the dollar cost. Our recommendation is that everyone start by amassing 1 months' of food storage per person per household. And once this is achieved, then save up 3 months' worth. Some folks we know even have 1 year's worth saved up, and we think that's a great long term goal to shoot for. And remember, too, you're not just building stores for those in your household. Should conditions arise when you need to lean on these reserves, you'll invariably have family, friends and neighbors who have not prepared as actively as you, who will be knocking on your door for help. (Watch this classic episode of the Twilight Zone for a dramatization of how desperate folks can get under such stress.) Saving up stores for those caught unprepared is not only charitable, but it decreases the sacrifices your household may have to make during a dire situation. So how do you go about saving up so much food? Fortunately, there are a number of ways to do this. And most of them take a surprisingly short amount of time. For those with the time and inclination, you can save money, build community, and customize to your exact tastes by packing your food stores yourself. A number of Peak Prosperity groups have coordinated community food-storage packing days, where folks get together to share the expense and labor. These days are enjoyable bonding events and filled with learning new skills (like heat sealing). If you think you might want to produce one of these yourself, you can read a detailed recount of a successful community packing day by clicking here. Also, the network of food canneries offered to the public by the Mormon Church are a fantastic and unbelievably low-cost resource. You do not need to be a Mormon to visit one and they don't pressure you about their faith when you're there. These canneries allow you to pack your own food in tin cans, pouches or in bulk containers (though the latter is not a good option for long-term storage). Or, if you want to skip the labor, you can just buy pre-packaged cans and pouches there. Adam documented his own experience using a Mormon cannery, which you can read by clicking here. If you do end up packing your own food reserves, you'll need quality food-grade containers to store them in. Again, we're big fans of the FoodBrick containers, which are companions to the containers we recommended in the early section on water storage (and with which they conveniently stack interchangeably). Also, be sure to use oxygen absorbers within each food container to reduce spoilage and extend shelf-life. How much (in terms of pounds) of each type of food do I need for each member of my household? A very helpful food storage calculator (in Excel) can be downloaded by clicking here. Peak Prosperity's Food Storage Wiki is an excellent compendium of all things food storage related. From a deep pantry shopping list, to a comparison of canned vs dehydrated foods, to a breakdown of the types of containers to use, it's worth reading in full. Consider stocking up on supplements as well, to make sure you don't become deficient in any essential vitamins. We like the offering found at iHerb.com. Have further questions? Ask away in our Food Storage discussion forum. Having a part of your calorie supply that you yourself produce is obviously a huge asset during emergency times. Growing a garden, a food forest, or raising chickens and other livestock are excellent investments of your energy if you have the time, means and interest. We discuss these further in the upcoming section on Living Capital. Even if you can't/don't produce any food on your own, it's always a good idea to source food from local sources (vs a chain store that depends on long supply lines). CSAs (Community Supported Agriculture), which offer you a share in a nearby farm's harvest, have proliferated over the past decade. If you don't already, consider joining one near you. LocalHarvest.org is a good search site that can help you locate CSAs in your area. Like our “just in time” food system, our modern medical infrastructure is highly complex; it functions well only under controlled circumstances and with abundantly available specific resources. As with food, the ease with which we’ve accessed medical services over recent decades has invited us to reduce our health self-sufficiency. We've become so sheltered from the health risks our forefathers faced that we're especially vulnerable if we're ever forced to live without easy access to professional care. Taking on a bit more responsibility and a few more preventive steps in one’s personal health is crucial; a must-do in the process of becoming resilient. Some of the steps recommended for beginners are universal; others depend on your personal needs. But in all cases, a good dose of foresight and practicality is in order to build some security into the future of your health. You should plan ahead for the things you know you’ll need: are there medications you take regularly? Do you wear contact lenses or glasses? What supplements, hygiene products, or nutritional supplies would you be hard-pressed to live without? You should also be prepared to handle unexpected accidents with first-aid supplies, along with the basic training needed to be able to use them. This is another area where preparing even a little vs. not at all makes a world of difference. Having a well-stocked first-aid kit on hand in your home and in every vehicle you use is a #1 priority. 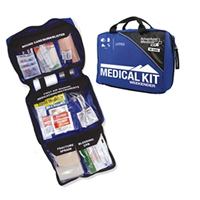 Adventure Medical offers a good selection of kits, with options to fit every budget. Be sure to place your backup store of medications in your first-aid kit, as well as dosage information, warnings, and expiration dates. We also recommend augment your kits with additional supplies of Tefla pads, which are a huge improvement over gauze pads. They simply do not stick to wounds--they are a miracle for wound healing, as you can change dressings without re-injuring the area. Also essential are QuickClot clotting sponges, which are wonderful in stopping bad cuts fast. Additionally, procure an assortment of Steri-Strips, which are sterile, breathable, tape-like strips that stick to skin and can close wounds that would otherwise require stitches. We find them to be extremely useful in times of triage. If there are any medications that you rely on, compile at least a three-month supply in case of supply chain disruptions. For most medications, this can be done by requesting a “vacation refill” at your doctor’s office. Stockpiling certain medicines may require a more detailed, private discussion with your doctor. If you wear glasses, have an extra pair on hand. If you wear contact lenses, keep a backup supply of extra pairs and lens solution. You might also consider getting Lasik surgery so you don’t have to worry about vision supplies in the future (both Chris and Adam have). Visit your dentist now, when you know your insurance is available, to get more extensive dental work done. Be sure to stock up on toothpaste, toothbrushes, floss, etc. Have a backup supply of hand sanitizer and other antiseptics, which are important for avoiding infection in situations where water is unavailable. In addition to storing food, store vitamins and supplements to maintain your health in periods when food choices may be limited. Take a basic first aid course and a CPR course. If you're like most folks, you've probably thought that this is something you should do, but haven't quite gotten around to it yet. Don't put it off any longer. This is valuable training no matter what kind of future arrives. To find a course in your area through the Red Cross, click here. You can also learn more about medical care preparedness by reading our forums and relevant books. Two favorites of ours are Where There is No Doctor and Where There Is No Dentist, which are packed with practical, meaningful information, appropriate in just about any circumstance you can imagine, and which any reader can follow. A final note here is that, though most of the tips above are useful only in triage or last-minute situations, a much bigger component of personal health resilience is simply eating well, exercising, and keeping stress and unhealthy substance use to a minimum. The fewer health issues you have, the less you have to worry about during an emergency. We address this in depth in our section on Living Capital. The extent to which not having access to a heat source presents a risk for you depends on your location and climate. Power outages in areas with cold winters, where damage to power lines is common during ice storms and blizzards, mean that electrically-controlled furnaces will not operate. A variety of other emergency heaters can be viewed by clicking here. Keep in mind that a degree of caution is needed when using any kind of space heater, especially varieties that use fuel (vs electricity). Be sure to carefully follow the manufacturer's instructions. If a power outage occurs in freezing temperatures, it can lead to frozen pipes. Even if you do have a reasonable supplementary heat source for space heating, it’s important to remember to shut off the water valve at the water service entrance in your house and to turn on all the faucets in order to drain remaining water from them to prevent damage to the pipes. One convenience of a winter power outage, as opposed to a summertime outage, is that refrigerated and sometimes frozen foods can be preserved outdoors if the temperature is cold enough. Cold-weather blankets, down comforters, wool sweaters, winter hats, and sleeping bags are very useful items to stock up on when preparing for a potential outage during cold weather. It's helpful to learn how to maintain core body heat by utilizing layers and covering up areas where body warmth typically escapes (head, neck, hands, feet). Insulating garments are also terrific money savers, as their use can help you inch your thermostat lower during times of rising fuel costs. There are many excellent manufactures out there, but one we are quite partial to is SmartWool. But new or used, insulating garments can be obtained through myriad sources, many -- like Craigslist, Freecycle, Yerdle, Goodwill, churches, garage sales, and family members -- free or nearly so. For countless reasons, being able to cook, even in an emergency, is non-negotiable. Covering the basics in terms of cooking means being able to boil water and thoroughly heat perishable foods. Boiling water, in addition to killing water-born pathogens, is the easiest and most convenient way to prepare long-term food stores such as rice, pasta, and beans. For those of you with gas ranges, you may be able to cook on your stovetop during an electrical outage just by turning on the gas and using a match or grill lighter, but for those with an electric range, or in more severe emergency situations, a backup option will be necessary. For cooking, we recommend the Weber Q family of outdoor grills. The Q grill works fine for everyday family grilling needs, so you'll get lots of enjoyment out of it even if you never need to rely on it in an emergency. It's easily transportable; you can take it to the park, the beach, tailgating, car camping -- pretty much anywhere. It's propane-fueled and takes both traditional 20-lb tanks or if you need to travel light, 14/16-oz canisters. Click here for even smaller, travel-sized camping stoves -- the kind you'd use if you need to carry your stove on a long hike. We especially like the MSR WhisperLite because it can and will burn anything from gasoline to white gas to diesel fuel in a severe pinch. It’s a true multi-fuel stove, and this flexibility is valuable. Whatever you choose to use, be sure to stock up on reserve fuel for your stove(s). As a more rudimentary backup, if you have or can build a simple fire pit, acquire a metal cooking grill to place over it. Note that all of the above solutions require a lighting mechanism. Be sure to stock up on emergency matches and fire starters -- you don't want to find yourself with stove but no way to light it. And for a solution that requires no fuel whatsoever except sunlight, we recommend investing in a solar cooker. We like the All-American Sun Oven, which can both cook and dehydrate food, as well as purify water. When the electricity suddenly shuts off, your options become drastically limited if you haven't prepared in advance. And for those of you who did, when you turn to your backup solutions, you sure want them to work as expected. Standardize around as few energy sources as possible. Use the sun as a backup power source whenever possible. So as a first step, for your essential electronic devices (flashlights, lanterns, radios, etc), build up a stockpile of rechargeable batteries. In order to reduce complexity, try to standardize on devices that all use the same size of battery. We recommend AA, as it's the most commonly-used size. GoalZero offers rechargeable batteries we like along with a solar recharging pack. It’s amazing how dark it gets when your house, your neighbors' houses, and the streetlamps lose electricity. Having some charged flashlights and headlamps handy will be a huge relief during that first “uh oh” moment of a power outage, especially if it happens at night. We strongly prefer LED lanterns for illumination because they're extremely battery-efficient (some will last 60 hours or more of continuous use on a single battery charge), the light is strong and useful (easy to read by), and there’s zero fire danger because they emit light but almost no heat. As a result, they are very safe for children and the elderly to use without any worries about fire or burns. Consider also having a store of oil lamps and candles as backup to your battery-powered lighting. They come with a fire risk that you'll need to determine is right or not for your household, but they're a dependable backup should your electronic options fail. "Anytime, anywhere" communication is an incredible enabler, and you should do all you can to preserve your access to it. Keeping touch with the outside world, either by tuning in to the radio or being able to contact loved ones by phone, can make a world of difference in how informed your decisions are with regard to the situation you are experiencing, and can also improve how you fare psychologically. For mobile phones, in addition to stocking a few backup batteries for your device, we advise investing in a solar battery charger to keep your phone’s juice topped off. The car adapters mentioned above are also a convenient, versatile option. We also advise keeping a landline phone in service as an emergency backup. In some circumstances, landline service will still be up and running when the cell tower communications network is down. Please note that landline phone service provided through some cable companies will lose service after several hours (six in our area). Check with your local phone company to be sure. Finally, self-powered radios (e.g., solar, crank) have reached a state of dependable utility where we feel comfortable recommending them. In times of emergency, especially if communications networks are also down, a self-powered radio can easily become your primary source of important information about the world around you. PrepareDirect offers a wide range of emergency radio options which you can review by clicking here. Sadly, it is becoming harder and harder to get your hands on your own money. If you try to make a large withdrawal at a US bank, the manager will need to get involved. If you withdraw more than $10,000, the bank is required by law to make you fill out a Cash Transaction Report, which is reported to the government along with your name and Social Security number. If you instead take out several withdrawals that over time add up to over $10,000 (called "structuring" if you're doing it to avoid a CTR), the bank is required to file a Suspicious Activity Report (if you're found guilty of structuring, you can be jailed and fined $250,000). Want to store some money overseas? Be sure you file Form 8938 with the IRS each year to report your holdings, else you can lose them for violation of the Foreign Account Tax Compliance Act. These are just a few examples of the growing thicket of red tape and government control over your money. Above and beyond that, the banks themselves are making it harder for you to hold the bills you rightly own in your hot little hands. The forms and approvals needed to transfer funds often take weeks to arrange. And shockingly, withdrawals of any amount are becoming subject to the approval of the bank manager working in your branch on a given day. Which is why you don't want to wait until disaster hits to build up a stash of cash outside of the banking system. Those who wait too long may awake to find the banks shut and their money inaccessible -- just like the citizens of both Greece and Cyprus discovered during their respective "banking holidays", as well as did the residents stuck in New Orleans during the aftermath of Hurricane Katrina. Or even if crisis doesn't arrive overnight, it may arrive faster than you can mobilize to move your funds through all the administrative red tape. We recommend slowly building up a minimum of 1 month's worth of living expenses an as emergency cash reserve. Personally, we feel more comfortable with 3 to 6 month's worth, and advise building up to that over time. You'll want a good part of this to be in lower denomination bills: $5s, $10s and $20s. During a severe emergency, you'll be one of the few individuals who has hard cash. As long as the system hasn't broken down completely, you'll be much better positioned than most to purchase necessary items, or exchange cash for essential services. If course, this stash can serve as a huge safety net for more "ordinary" tribulations, such as the sudden unexpected loss of a job. With several months' worth of expenses taken care of, you can stress less and have more capacity for working on what to do next. Another way our money is under threat is from excessive money printing by the central banks. Since 2009, the "quantitative easing" programs the world's major central banks have embarked on has flooded the globe with over US$4 trillion of new thin-air money (or double that if we include the Central Bank of China). The more dollars there are in the world, the less value each individual one has. This explains a lot of the rapid increase in prices we've been experiencing in nearly every kind of asset class under the sun: housing, education, stocks, bonds, fine art, healthcare, movie tickets, you name it. So, the purchasing power of our money is being eroded each year as more money is created. And with no limit to how much they can create, there's little reason to expect the central banks to change their behavior (at least not by their choice). How does one protect the value of their money in this kind of world? By investing in assets that cannot be inflated away to worthlessness. These are tangible assets with intrinsic value. For example, fertile farmland will never be worth nothing; it has a reality-based value dependent on the kinds of crops and livestock it can produce. Stock in a profitless dot-com company on the other hand, only has value as long as someone believes it does -- if others stop sharing that belief, it's worthless. One of the easiest ways to exchange a paper asset for a tangible asset is to use some of your dollars to purchase precious metals. Gold and silver have been considered money for millennia around the world, and unlike cash, they cannot be inflated ad finitum. To get more supply we have to mine more, and that's a costly, labor-intensive process. Which is why we strongly recommend that everyone consider developing at least a foundational exposure to precious metals. By this we mean 5-10% of their financial wealth (of course, this decision should be made under the guidance of a professional financial adviser). If you don't currently own any precious metals, please read our Guide To Buying Gold & Silver for an overview of the process. After that, visit our Where To Buy Precious Metals page if you'd like direction on providers whom our readers like. And for the money you leave in the system (bank savings, retirement funds, etc), we urge you to design your plan for managing them with a professional financial adviser who has an appreciation for the risks to capital noted above. We are now years into a time where central banks have caused such asset price inflation that prices are no longer tethered to fundamentals. It's our belief that fundamentals will indeed win out in the end -- and that a financial adviser who prioritizes risk control, liquidity, and market skepticism will be extremely valuable to wealth preservation. If you're looking for a qualified adviser, we find that inviting them to watch The Crash Course is a good litmus test: if they disagree with it, you'd be better off finding someone else to work with. And if you'd like to have a (free) exploratory conversation with the financial adviser endorsed by Peak Prosperity, click here to submit a request. Even during the best of times, it's wise to "hope for the best but plan for the worst" when it comes to crime. And, of course, when times become troubled, looting and violent crime rates spike. Your best path to reducing your vulnerability to crime is to educate yourself on the risks, and then determine which ones are highest given your personal situation. We highly encourage you to read Peak Prosperity's Personal Safety & Home Defense Wiki which will help orient you on the issues to consider most. Many other useful articles on the subject are available in our site's Personal Safety & Home Defense Group, a discussion forum where you can ask readers well-versed on the topic for advice in addressing your specific security-related questions and needs. Lastly, while we understand that not everyone is comfortable with them, a number of people have questions about the role firearms can play in personal safety. To help you learn and make the most informed judgments possible, we've created both a Firearms Wiki and Firearms Group as resources. The value of community is never greater than in times of need. None of us can be prepared for every possible risk, and receiving assistance from others makes facing adversity easier and a whole lot more pleasant. Get to know your neighbors. Take a walk -- literally. Get outside and walk down your street. Do you know all of the people who live on your block? (Or in your building, if you live in an apartment?) These are the people who you'll be dealing with in the aftermath of any unexpected crisis. Learn their names. Make sure they know who you are. Do they have any skills or tools that will complement your preparedness efforts? What can you depend on them for, and vice-versa? A good ice-breaker for knocking on the door of someone you don't know is emergency preparedness. It's something everyone in every community has a stake in. Asking for easy interaction, like participating in a contact tree to make sure everybody in a neighborhood is accounted for in the aftermath of a crisis. The government's Community Emergency Response Team (CERT) network can help you locate an existing group to plug into, or equip you with the resources to start one in your own neighborhood. You'll find that, at a minimum, you'll enjoy the greater sense of connectedness that comes with knowing the folks who live near you. Above that, you'll find that your neighborhood exploration will likely spark discussion and collaboration, increasing the level of resiliency for all. Come to a shared understanding with your partner. A very common we encounter here at PeakProsperity.com is that when somebody watches The Crash Course and gets motivated to start "preparing", their significant other does not share the urgency. We see this dynamic so often that we've given it a name: the Reluctant Partner Disorder. In too many cases, the opposition creates a toxic friction that can put the relationship in jeopardy. If this is a situation you're dealing with, read our guidance on dealing with a reluctant partner. We've learned a good number of success techniques from helping couples cope with their differences (as well as from navigating this territory with our spouses in the early days.) When your environment is placing stress on you, you do not want to be unable to lean on the person who should be be counting on most for support. Create opportunities for deepening social understanding and engagement. The better you and your neighbors know each other, the more inclined and more informed you'll be to support one another under pressure. Read our Community Building Guide for best practices, many of which don't cost any money. Tap the power of the Peak Prosperity community. Our Groups let you connect with others in your local area to collaborate in the real world. And our worldwide community of members is amazingly knowledgeable -- if you have a question on any topic, just post it to the site. Our readers are quick to provide any help they can! Or consider coming to one of our annual Peak Prosperity seminars, where you can enjoy joining a room full of like-minded people who see the world similarly as you do. The learning and camaraderie built at those events make them our favorite weekends of the year. If you’ve followed the steps recommended above, you're off to a great start – but it's just that: a start. We are living in tumultuous times, and the terrain before us changes constantly. We advise you to read the remaining guidance contained within this guide, which provides additional direction on how to deepen your resiliency across the various 8 Forms of Capital. Continue to visit and read the articles here at PeakProsperity.com. We'll continue our daily analysis, reporting on events as they unfold and assessing what their implications are mostly likely to be. For those of you interested in our deepest analysis and guidance, consider Enrolling to receive it. And don't forget the big picture. You're building resilience to enhance your options, no matter what the future may throw at you. Make sure to enjoy the present as you work to secure the future!